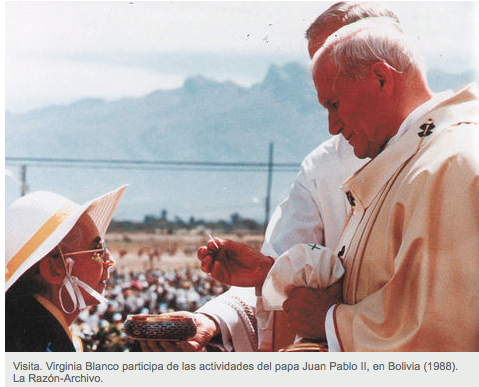 LA PAZ, 19 Feb. 05 / 12:14 am (CNA) .- The Archdiocese of Cochabamba reported already the conclusion of the diocesan phase of the beatification process for Virginia Blanco Tardío, a lay member of the Catholic Action, which could become the first blessed of Bolivia. The group of prayer and friendship Our Lady of Mercy was responsible for promoting the cause. The Archbishop of Cochabamba, Msgr. Tito Solari Capellari, inaugurated on January 31, 2001. Father Miguel Manzanera, Chief Judge, presided over the Court that examined 45 witnesses who knew Blanco. We also picked up other testimony, biographies, writings and mystical poems of much literary value. With this information the documents were drafted and will be transported to Rome by the current postulator, Salvador Sanchis. Virginia, second of four daughters of Luis Pio Blanco Unzueta and Daria Tardío Quiroga was born in Cochabamba on April 18, 1916. She earned her high school degree in Humanities at the College of the Handmaids of the Sacred Heart of Jesus, which she remained tied as a member of the Marian Congregation of Alumnae. She had a general culture far superior to that of most women of her time and had extensive biblical and theological knowledge. She earned the title of Professor of Religion for High School when she was 32 years old. Since she was little, Virginia was an exemplary catechist, work being conducted in Castilian and Quechua, she was preparing children, youth and adults to receive the sacraments and baptized more than once, children in danger of death. She was loved by her students to whom she taught religion in several public schools in Cochabamba for 40 years, of which over 10 years, she worked without receiving any payment in return. Ever since her young age, Virginia was an active militant of the Catholic Action, and for many years Diocesan President of the Women’s Association of Catholic Action (AMAC). In 1954, work called “economic Kitchen” for poor people. Since 1958 the work was known by the name of “Social Dinners” and continues to present their services. Later she opened her own house in the “Popular Dinners” that still work. In 1962, she founded the Friendship Prayer Group and whose counsel was Father Julián Sayos SJ. The group was formed on the basis of some former students of the College of the Handmaids of the Sacred Heart. On December 8, 1977, in the home of Virginia Blanco the Policonsultorio “The Rosary” was opened to serve poor people. Virginia died of cardiac arrest on the night of July 23, 1990, at 74 years of age. Here a photo with the Pope Juan Pablo II. To read the full Spanish article, please use this link. Bolivia is proud to have individuals with kind hearts like Virginia Blanco Tardío. I welcome her to The Hall of Bolivian Fame! This entry was posted in Bolivia, Cochabamba and tagged catholic believers, Catholic Church, religion. Bookmark the permalink.